This package includes 1 DVD Set, 1 User Guide, 2 Companion Manuals. 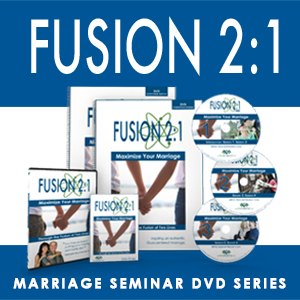 Learn how to Maximize Your Marriage through the Fusion of Two Lives in the Fusion 2:1 marriage-building DVD experience. Passionate about inspiring an authentic, God-centered marriage, Dr. Dave and Donalyn Currie teach biblical truths about your most important relationship. This is a one-of-a-kind, marriage-building study filled with hard-hitting, heart-warming practical help for couples of any age. The 6 sessions allow huge chunks of time for couples to work through and discuss 15 projects helping them braid powerful and practical truths into their lives. The Laws of Attraction – if you stop having fun, commitment alone won’t keep your love alive. The Gravity of Baggage – Resolving your hurts releases you to love freely. The Acceleration of Connection – Understanding your spouse at a deepening level helps them feel respected and loved. The Drag of Friction – Responding to disagreements with respect brings you closer. The Combustion of Passion – To love and be loved sexually creates a unique and powerful bond that joins you for life. Fusion 2:1 is transforming couples across North America — and it can transform your marriage too. If you cannot ship to your current location, contact us with your special order and requests.